A new, more intuitive default theme. A redesigned admin area to help you more easily manage your network and users. Simpler HTML and CSS frameworks. This mean Elgg themers' lives just got easier! Better caching and easier inclusion of external CSS and JS. A new elgg.js object that allows quick and easy ajax integration, i18n, automatic security token renewal, and other advanced features. A new, more robust menu system. A new forms system including sticky forms to prevent content loss. More advanced plugin management features for developers. These features are just part of what makes Elgg 1.8 so exciting. There are a number of changes to Elgg 1.8, so plugins written for Elgg 1.7 shouldn't be expected to work immediately on Elgg 1.8. The core team is publishing guidelines for updating 1.7 plugins and themes, and Cash is working on a plugin that will provide compatibily for older plugins and themes. Also, if you missed it, Cash wrote a post on how developers can start preparing their plugins for Elgg 1.8. Elgg 1.8 is shaping up to be a significant release. We're looking forward to hearing about your testing, receiving bug reports, and receving other feedback about the beta! I now have a fully-ajaxed version nearly ready (based on a modified version of jquery hijax). I have also integrated facebox-based popup ajax dialogs using Evan's ajax elgg.action. Great stuff. I'll be sharing it soon. Last but not least, I have it all up and running with 420M profiles and over 20 billion relationships! Great work Cash, Brett and Evan. Very encouraging! Excellent, i'll be testing with nginx! We think your server is running the Nginx web server. The rewrite rules test failed. You need to configure your web server with Elgg's rewrite rules and try again. 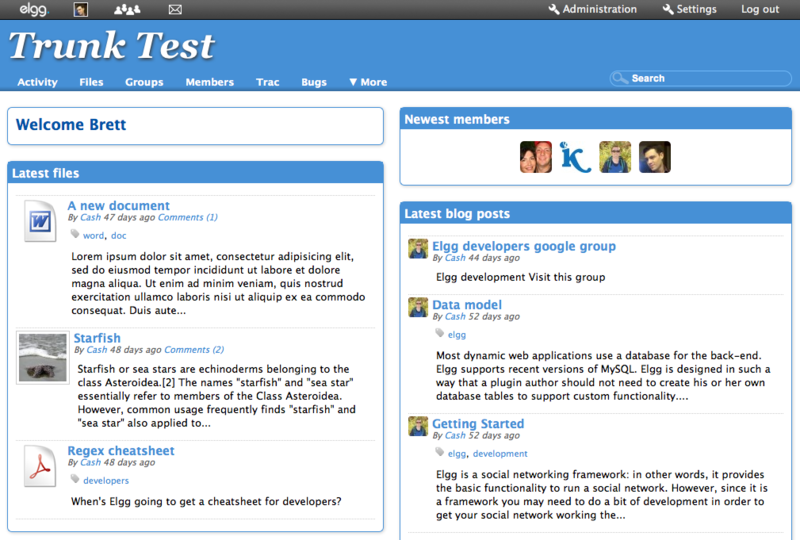 On the profile page, it is difficult for the first time community users to distinguish widget columns with the default theme. Great installation process, CEO-friendly URLs! Looking forward to testing it more. @Shouvik - set default widgets and then create a test user and see what you think. Cash did you get the short URL's in? I thought you mentioned not in 1.8...if so, wooo double hoo! I have had a go with this, but when I try and create a group, there is no Group Name field, so it will not save... anyone else found this? MMM... it must have been a duff upload... redid it and it is fine now. It all looks really great, just need to get my plugins all working and a pretty theme and all will be cool! No, it is working fine. All I am saying that while in the edit mode, there could be some thin borders or something that separates the widget areas where they are to be dragged in the profile. are not the only ones with "Elgg Brains"
what is elgg without involved community members? @TahoeBilly - you can thank Evan for that. finally I tryed it a little and my first impression is: FANTASTIC!!!! I downloaded the beta, installed it .. and played with it. Still needs a lot of bugfixing ! .. but it really looks good. I just miss some tool to arrange the pages. Or perhaps i am missing smth, but i do not see how/where i can decide where a certain widget should be placed. @wannabe -- bug reports are appreciated and can go to trac.elgg.org! As for arranging the widgets, each user decides which widgets go on their profile/dashboard. You should go to those pages to edit your personal settings.